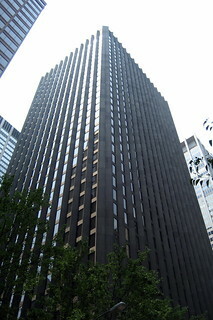 The CBS Building, also known as Black Rock for its dark granite cladding, is the 38-story headquarters of the CBS Corporation. Opened in 1965, architect Eero Saarinen and then CBS president, Frank Stanton, designed it with pillars that are prominently featured over the glass windows, contrasting the style of most nearby skyscrapers of that era. This was the first skyscraper in New York City to be built in reinforced concrete, rather than with a steel frame. It is set back 8 meters from each plot line, partly to isolate it from the neighbouring buildings, partly to take it clear of the subway line running underneath the north-western corner of the plot. On the Sixth Avenue side there is a shallow sunken plaza. The lobby is clad in white travertine, with dark granite columns as a contrast.